Supermarket giant Asda said it has been forced to order dozens of new baskets because of a shortage at a store - caused by customers taking them home. The baskets went missing at the store in Cambridge after the company began phasing out 5p plastic bags. The store only has 30 to 40 left for its customers. An Asda spokesman said the firm asked "that the small number of customers who are taking our baskets home with them use their bags for life instead". A new load of 100 plastic green baskets to replace those that have gone missing is set to arrive at the store at the Beehive Centre next week. A 5p charge on the thin, single-use plastic bags was introduced in 2015 but Asda pledged in February to end the sale of those bags by the end of this year. Stocks of 5p bags at Asda stores are no longer being replenished when they run out, but larger and sturdier "bags for life", costing 9p, are still available. 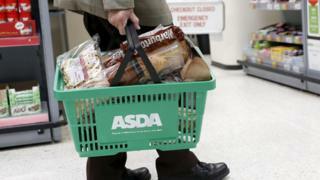 Currently, Cambridge is understood to be the only Asda store with a basket shortage. Asda, Sainsbury's, Tesco and Morrisons have all either phased out the single-use plastic bags or are in the process of doing so. Other retailers have electronic tags on their baskets in some stores as a preventative measure to avoid customers taking them home. Sainsbury's said it was not aware of any issues with baskets being taken from its stores. An Asda spokesman said: "After listening to our customers and their concerns about plastic, we made the decision to phase out our single-use plastic bags, in all of our stores, by the end of the year. "We're trying to do our bit to protect the environment, and would ask that the small number of customers who are taking our baskets home with them use their bags for life instead." Cambridgeshire Police said it had had no reports regarding the taking of baskets from the store in the past month. Plastic bag charge: Where does the money go?